Several new Sony smartphones have appeared, including some specs. The display ratio reveals more details about the design of these phones. We expect many new smartphones in the first three months of 2018. One of the phone manufacturers we expect to present several new models is Sony. Sony Mobile is one of the last to produce high-end smartphones with traditional large bezels. So will this change in the Xperia 2018 line-up? I´m afraid we have bad news for those who are hoping for a completely redesigned Sony Xperia smartphone line-up. Our good friends over at Mobiel Kopen found a large series of new model numbers, including the display resolution for each of the devices. Regretfully we see a classic 1920×1080 and 1280×720 resolution for all models. This means the devices get a 16:9 aspect ratio, instead of the wider 18:9 we see in modern phones like the Galaxy S8, the LG G6, the iPhone X, the Huawei Mate 10 Pro, and the HTC U11+. Earlier this month we already wrote about the upcoming Sony H3213 that appeared in the GFXbench benchmark. We than concluded Sony would use the ‘H’ for its 2018 model numbers. As Sony’s 2016 line-up consisted of models with an F-model number, while the 2017 Xperia models were numbered with a ‘G’. 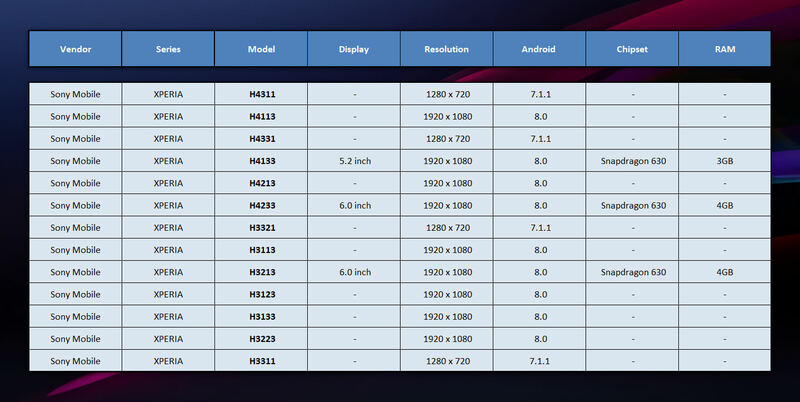 Now thirteen new model numbers are known; the Sony H4113, H4311, H4331, H4133, H4213, H4233, H3321, H3113, H3213, H3123, H3133, H3223 and finally the H3311. 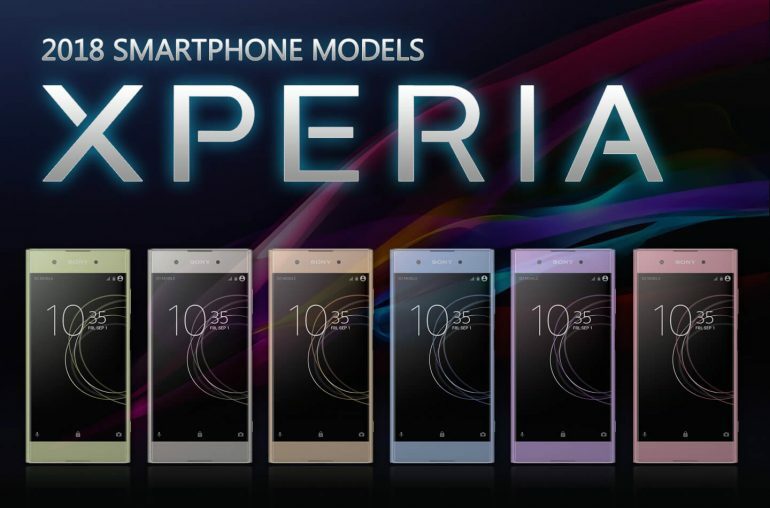 For the record, this doesn’t mean Sony is about to launch 13 different Xperia models. A certain smartphone can have multiple model numbers, based on different SIM variants, country area etc. We see at least three different models, one with a 1280×720 screen size (running on Android 7.1.1) and two with a 1920×1080 screen size (5.2-inch and 6.0-inch). The Full HD phones both run on Android 8.0 and get driven by the Snapdragon 630 processor. This data has been obtained from multiple recent HTML5 tests. 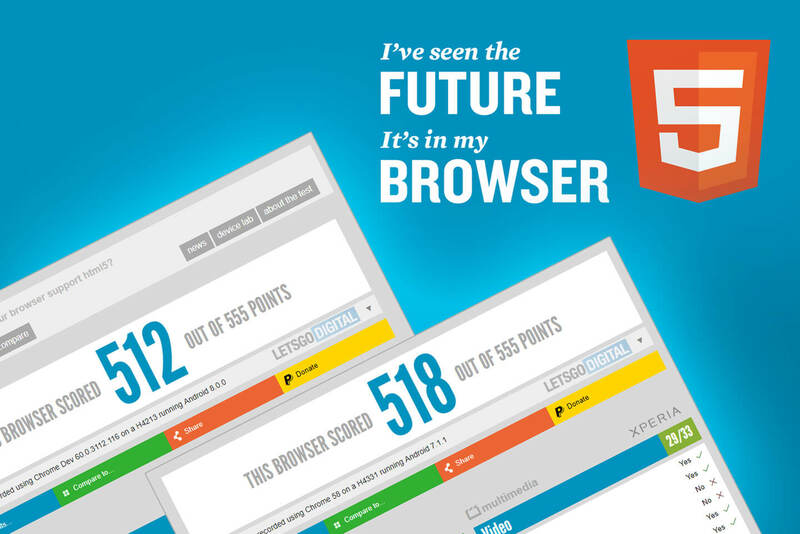 The HTML5TEST website is used as a benchmark to test browsers. The results have been compared to the corresponding UAprof documents, showing the same data as described above. The HTML5TEST documents can be seen here, here , here and here. According to the latest rumors all Sony Xperia smartphone models will get a new design in 2018. The four year old Omnibalance design is likely to be replaced for a design called Mirai (Japanese for ‘future’). Many of us hoped this would mean a bezel-less design. But Sony fans, don’t get too disappointed, as the chipset used for the Full HD models was just a midrange processor, we may still not know what the model number of Sony´s upcoming flagship model will be. Meaning there is still a change Sony is going to surprise us with at least one smartphone with a renewed design. Last week we also came across a new Sony trademark for a Dynamic Vibration System. At this moment its unclear which Xperia models will feature this optical image stabilisation. Sony is likely to introduce its new 2018 line-up in February, just before the Mobile World Congress kicks off. The trade fair will be held from Feb 26 – Mar 1 in Barcelona. A second series of Xperia models will be released just before the IFA 2018 in September.